Relationships are pivotal to lasting change. Through meeting both practical and tangible needs, trust is built and communication begun. 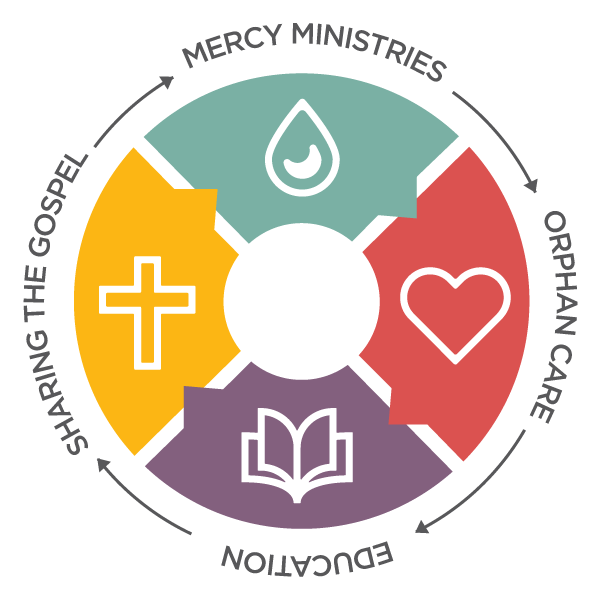 Hundreds of thousands of men, women, and children have been impacted through our Mercy Ministries. In a country where millions of children are unwanted and abandoned, we have taken on the biblical mandate to care for the orphan to heart. We believe that EVERY child deserves the opportunity to know Christ and know love. In a country where millions of children are abandoned, we have taken on the biblical mandate to care for the orphan to heart. We believe that EVERY child deserves the opportunity to know Christ and know love. In a nation plagued by the caste system as well as a 40% literacy rate, we acknowledge that true freedom will only come through the ability to make choices, gain willful employment, and pass this invaluable gift onto future generations. Education is the key. As you get in touch with the intense physical needs of the people of India, you’ll soon find out that without the basic necessities of life, it is difficult to hear the message of God’s love. As followers of Jesus, we believe that we are called to simultaneously share the Good News and embody the Good News of Christ. As you get in touch with the intense physical needs of the people of India, you’ll soon find out that it is difficult to hear the message of God’s love without the basic necessities of life. As followers of Jesus, we believe that we are called to simultaneously share the Good News and embody the Good News of Christ. Our strategy is to be intentional whether distributing food, or caring for an orphan for one day or for their entire life, or running an academic calendar in a major institution, or doing a major outreach in an unreached village. Not only are we looking to meet the “right now” needs, but we are looking to invite each person we encounter to be a part of a community so that they can experience true life change. We want them to know that they matter and that they are loved. It tangibly looks like having young pastors trained in our Bible Colleges, so that after a Mercy Camp there is a pastor visiting or living in that area, ready to follow up with those we treat. We not only want to care for the physical needs but the emotional and spiritual as well. Our strategy is to be intentional whether distributing food, caring for an orphan for 1 day or for their entire life, running an academic calendar in a major institution, or completing a major outreach in an unreached village. Not only are we looking to meet the “right now” needs, but we are looking to invite each person we encounter to be a part of a community so they can experience true life change. We want them to know that they matter and that they are loved. It tangibly looks like having young pastors trained in our Bible Colleges, so that after a Mercy Camp there is a pastor visiting or living in that area, ready to follow up with those we treat. We not only want to care for the physical needs but the emotional and spiritual as well.